Not long ago I wrote a post showing you all my pram wish list. If you have not seen it, you can read it here. When looking for a pram there are a few important things you need to think about before actually buying one. If you are not a parent or never been in the situation to buy a pram, you would never think that buying a pram needs a lot of thinking. Size of pram Firstly you need to think about the car (if you have one). Will the pram be small enough to fit into the boot, once folded? But also if you are the type of person who walks to shops and goes out shopping often, is the pram small enough to go through doors? Is the pram practical to go through ailes of the shop? You don't need a bulky pram. Weight of pram The last thing you need is a pram that is going to be way too heavy. Especially if you have other children, the last thing you need is a heavy pram. There are many lightweight and practial prams in shops these days. Basket Are you looking for a big basket? If so then maybe this should be on your list when looking for a pram. There aren't a lot of prams with big baskets but there are some out there. When you have other kids, it is handy to have a decent sized basket under the pram. It's also ideal if you are planning a full day out. Will it last? Will the pram last to 3+ years? Prams are so expensive these days. But there are prams that do from newborn up to the age of 3 or 4 years old. You could save a lot of money if you buy a pram that can last you for 3-4 years. There are also other things you need to think about, such as, is the pram strong and stable enough to last that long? And another point I said above, the weight of the pram. If you are looking for a pram to last 3-4 years you may need a lightweight pram. 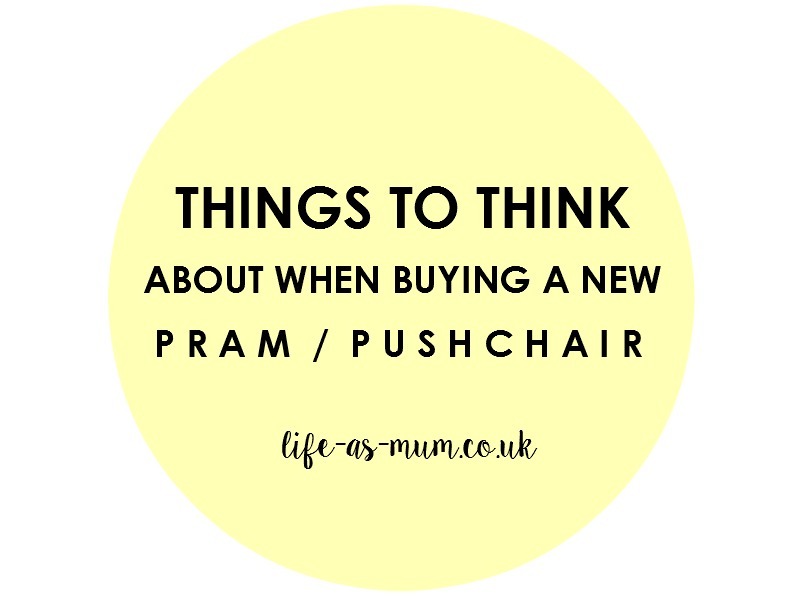 What did you think about when you were buying a new pram? Nice post. We inherited our pram - in fact, a whole travel system - which meant that even though it is a bit bulkier than we would like, we didn't have to go through the whole decision-making process. Finding a new car seat for baby number 2 was hard enough!